I’ve fallen a little bit behind on sewing in the past week thanks to a teething bubba. He’s lucky enough to be getting four top teeth at once! I finished the Socialite Skirt this morning, only it isn’t the Socialite Skirt! The knit I used was quite thick and I was worried the pleats might make it too bulky so I followed the tutorial, omitting the pleats and extra width, and ended up with…. I’ll definitely make more of these as they are so comfy! 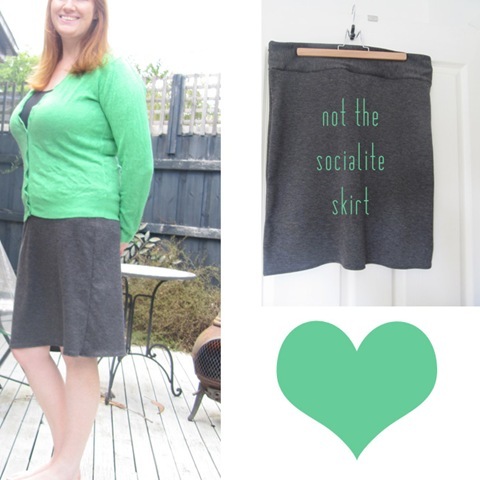 If I find a thinner knit in the stash I’ll try the actual socialite skirt!